The last regular post before Christmas. RD Burman again, and a rather good one even though it's not among his most memorable, or at least not the most immediately accessible. 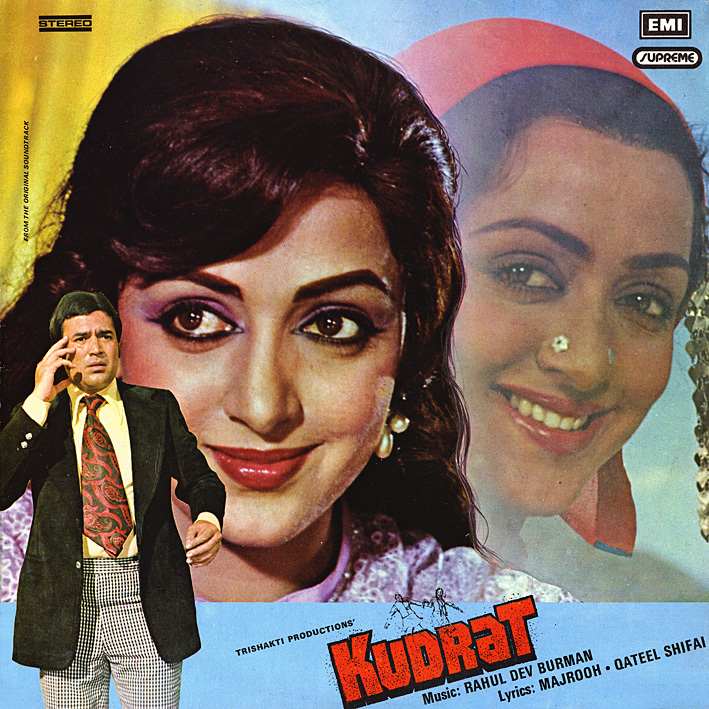 'Kudrat' [review] has grown on me a lot since I first got hold of it. Contrary to some of Burman's better know soundtracks this doesn't contain anything very elaborate or explosive, just really well-crafted songs. The piano on both parts of 'Sajti Hai Yun Hui Mehfil' and the strings on the first 'Hamen Tumse Pyar Kitna' are sumptuous. Parveen Sultana's singing on the second version of the latter is spellbinding... it's always nice to come across singers I haven't heard before. Chandrashekhar Gadgil is another new voice and the groove on 'Dukh Sukh Ki' is irresistibly hypnotic. (A version sung by Mohd. Rafi serves as the film's title music; for reasons unknown to me it doesn't feature on the LP.) Best of all is the very cool, almost laidback disco track 'Chhodo Sanam' which is the sort of thing that will make you want to dance, but slowly, nonchalantly, with your eyes closed. An album of music to relax to then. I'm sure I'm not the only one who can use that in December. I'll be back before the new year with a couple of specials; in the meantime, happy holidays to all. For the record, I prefer Gadgil's version. He doesn't have the voice that Rafi does, but it captures a lot of emotion and the music is groovier than Rafi's more traditional sounding one. Ah great, thanks for the info, I suspected it might have been something like that. Not sure which one I prefer myself to be honest… I wish they'd included both. thanks a damn million. merry xmas. PC, THANK YOU!! I have been wanting a good version of part 2 of Sajti Hai forever! At this stage in my collection it is so rare that my short wish list is fulfilled. I love the dramatic piano intro there. My old solo cassette version was not that great for that part of the reel. Other releases have been combos, therefore omitting that song. @gabrujat / Vikram Singh, could you please share where I can buy the officially released Rafi version of Dukh Sukh Ki? I checked iTunes/Amazon/eMusic and don't see it. I have been out of the loop as far as new CD releases for the past several years. Do you happen to have the name of the CD (I assume it is probably a compilation CD)? I would love to compare it to the DVD versions I have. Deewani, it appears to be on a CD entitled Uncut Gems - Pancham; supposedly available from flipkart.com. (To the person who posted a comment about this; thanks for the info but I never publish live links from anonymous or unknown sources - re. the FAQs). Hello PC, How to download the songs? DL links are generally in the first comment to every post.